Keeping a bicycle under cover protects it from winter weather and prying eyes, but with urban areas short on garages and sheds, for many it’s easier said than done. 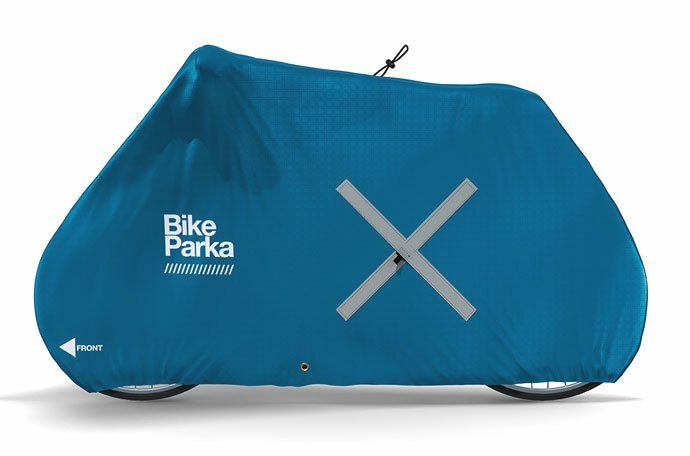 When a manufacturer of tents was challenged to address the problem, the result was Bike Parka – a high-quality, fitted water-proof cover for bicycles. In the way that today’s all-weather cyclists have forgone the traditional cagoule in favour of waterproof, yet breathable jackets, so Bike Parka offers a technical alternative to the basic tarpaulin. Manufactured from rip-stop, the lightweight material used to fabricate sails, parachutes and kites, the Bike Parka features sealed seams, an elasticated fit and a slot through which to pass a lock. We have a Bike Parka Urban worth £40 to give away. To be in with a chance of winning, simply leave us a comment at the bottom of this page. My bike would really appreciate one of these please, …….rain’s on the way! Better than using a plastic bag to ensure a dry seat awaits when a leave work. A great giveaway with wonderful timing. After a beautiful summer, the winter rains are coming. Fingers crossed and thanks to ETA. This would be super useful to keep the rain and dirt off my pride and joy! Would make all the difference to my winter commuting. With this I don’t need to fix the leak in the hall – do they do pink? It might even double up as a tent. Really handy to keep those heavy-dews off that start in September, and that are not good for leather saddles. Looks great but where is the fluffy bit around the hood? One of these would be great for my daughter – renting her first flat and the new bike will have to stay outside. Keep up the good work ETA! This is just what I need to keep my commuter bike dry outside my office all winter. I am really pleased with my bike rescue with ETA it gives me peace of mind whilst I’m riding my bike on my own! I reckon Richard Scrase should win this, for his honesty in not keeping up with his house maintenance, but mostly for his admission of his love of pink! Yes please, I’d love one! I’d love to “bag” one of these! Well, if WE wrap up warm why shouldn’t our bikes?! Yes m’lady – my bike would love a Parker! This would be a great idea instead of using old thread worn bed sheets. My bike needs its own duvet day! My folding ebike isn’t heated and gets cold in winter. My folding e-bike doesn’t have a heater! Ooh could do with this to keep the frost off my saddle. Don’t want frozen assets…. This is a fantastic idea. I would use it to keep my bike when I leave it outside at work. No more soggy saddle when riding home. I have a nice old Raleigh racer, but no shed or garage, but my wife hates me keeping the bike indoors. A bike parka would be ideal as it would keep my bike from getting soggy and rusty when it is stored outside during the winter, whilst keeping my wife happy too! I’ve won, it’s a wrap. Excellent idea, rain coat for my bike, and might make it less obvious for thieves. Maybe a a green camouflage version would help it blend on the allotment and in gardens? Would love to try this snug cover ! A comment at the foot of the page. If selection is random, it could still win! Like the arrow saying Front, and the fact that this matters because the thing is properly bike shaped. Such a brill idea! Ever since my landlord doesn’t allow bikes indoors I have been forced to leave my bike outside. This would be very helpful to preserve my bikes integrity! I’m looking out the window at my handlebar sticking through a tear in its cover so a new Bike Parka would be just the ticket before the weather gets too bad! This looks to be a really good quality cover from BikeParka. So much better than the mattress poly bags I’ve been using for my trusty stead! Well done to ETA for the opportunity. My car’s got its winter coat on already and my bike would like to have one too. What a great addition to the family this would be! Please Pack me a Parka for parking my pedals. I ran out of space in the garage for my daily commuting hybrid many moons ago, so this would be very useful to help protect against the dreaded rust! Is it time for you to do car insurance? One of these would be perfect to keep bike dry. Looking out of my office window right now, this is EXACTLY what I need! It would be an enormous improvement on the hotel shower cap I am currently using.